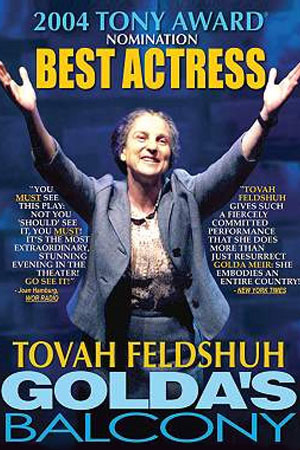 Tovah Feldshuh stars in the ORIGINAL GOLDA’S BALCONY as seen on Broadway. This is the compelling, edge-of-your-seat story of Golda Meir…from impoverished Russian school girl to Prime Minister of Israel! GOLDA’S BALCONY originally opened Off-Broadway in 2003, where it sold out its 16-week run. Six months later, the Broadway production premiered and ran for 507 performances, making it the longest-running one-woman show in Broadway history!